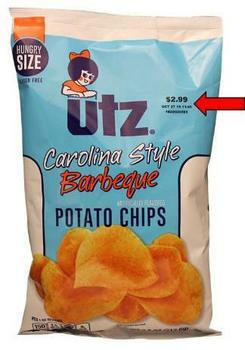 Utz Quality Foods is recalling its brand of Carolina Style Barbeque Potato Chips. The product may contain soy, an allergen not declared on the label. No illnesses associated with this recall have been reported to date. The recalled products were shipped to retail outlets in Alabama, Arkansas, Colorado, Connecticut, the District of Columbia, Delaware, Florida, Georgia, Illinois, Indiana, Kentucky, Louisiana, Massachusetts, Maryland, Maine, Mississippi, North Carolina, Nebraska, New Hampshire, New Jersey, New York, Ohio, Pennsylvania, Rhode Island, South Carolina, Tennessee, Texas, Utah, Virginia, Vermont and West Virginia. Customers who purchased the recalled product and have an allergy or sensitivity to soy should not eat the product, but return it to the store where it was purchased for a full refund or exchange, or simply discard it. Consumers with questions may contact the firm at (800) 367-7629 Monday through Friday, 8:30 am – 5:00 pm (ET), or by email at customerservice@utzsnacks.com.